In Wave Engine 2.5.0 we have improved the 3D Physic API, adding new features and enhancing existing ones. We’ve tried to maintain the name of Bullet properties and methods to facilitate the adoption of the new physics. Kinematic. If the body is kinematic, collisions, joints or forces will not affect this rigid body. However, the body will be affected by impulses or by specifying angular and linear velocities. A typical kinematic body could be a movable object in your level, a platform, opening door, etc. StaticBody3D. This component represents a physic body that isn’t moved by forces such as gravity, collisions or impulses. But other rigid bodies can collide with them. Typical static bodies are immovable objects like floors, walls, fences, etc. Every static mesh of your model could be a good candidate of static body. In previous Wave Engine versions RigidBody3D component required to have a Collider3D component, and ONLY could have one collider. Now, like in 2D Physics, this dependency is removed. You can have a PhysicBody (StaticBody3D or RigidBody3D) without a Collider3D, but as a counterpart, you can add to an entity all Colliders that you desire. 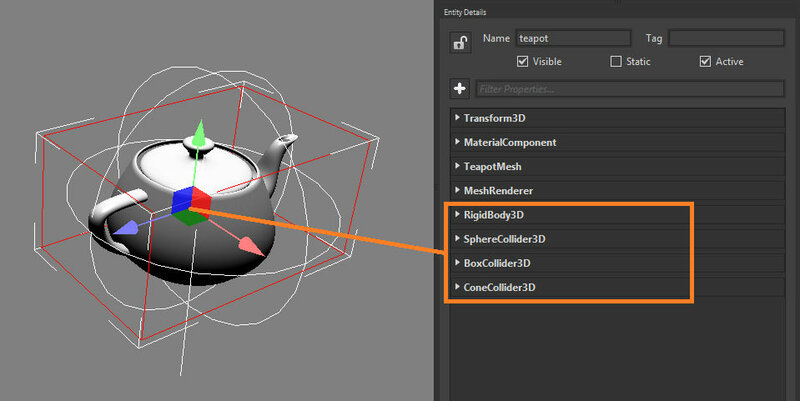 Basic shape colliders (BoxCollider3D, SphereCollider3D, CapsuleCollider3D, CylinderCollider3D, ConeCollider3D). Creates basic convex shapes as colliders. IsConvex = true. It creates a convex hull mesh using the specified mesh. A convex mesh collider allows to collide with other Mesh Colliders. IsConvex = false. The collision is more accurate, but this collider could not be attached to a RigidBody3D (use a StaticBody3D instead). Bullet Physics has several Joints that can be used to connect two bodies together. These joints can be used to simulate interaction between objects to form hinges, springs, chains, etc. Learning to use joints effectively helps to create a more engaging and interesting scene. In previous WaveEngine versions, to specify joints with the Joints3DMap component, which store the list of joints associated to the entity, now we’ve removed that way of work. Now each Joint is a Component itself, and you can add several Joints to an Entity in the same way as Collider3D instances. We have reimplemented all Joint3D properties to be more usable in Wave Editor, and now is more straightforward to adjust anchors, angle limits and much more. Bullet offers a bunch of different queries for retrieving information about collision objects. A common use case is sensors needed by app logic components. For example, to find out if the space in front of an NPC object is blocked by a solid obstacle, or to find out if an NPC can see some other object. Ray Test. The simplest query. Shoot a ray from one position to another position. The ray test methods will then return a result object which contains information about which objects the ray has hit, the position and normal, etc. Sweep Test. Similar to Ray Test, with a subtle difference. The sweep test uses a convex shape which is moved along from the start position to the end position. Sweep test can for example be used to predict if an object would collide with an obstacle if it was moving to a specified position. Contact Test. Two kinds of contact tests. One which checks if a physic body is in contact with other physics bodies, and another that checks if a pair of bodies are in contact.